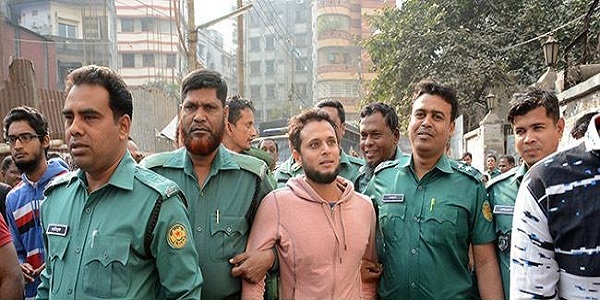 Dhaka – Cricketer Arafat Sunny was accused in a case that he had demanded dowry of over 2 million taka from a woman who claimed to be his wife, court officials said. Nasrin Sultana, who claims that Sunny married her few years ago, filed the case with a magistrate court in Dhaka on Monday, a day after the cricketer was arrested over infringement into privacy. Police on Sunday arrested Sunny in Dhaka after he was accused in a case under Information Communication Technology law filed by Sultana with Mohammadpur police station. In the latest lawsuit, Sultana alleged that her husband demanded dowry worth about Tk 2 million and the court of magistrate Raihan Ul Islam asked the cricketer to appear before it on April 5 for hearing. Sultana claimed that Sunny and she were wed-locked on December 4, 2014. Six months into the marriage, the plaintiff said, Sunny demanded the money on July 29, 2015. Sunny verbally abused her and provide nothing to his wife as the amount was denied, Sultana claimed. Sunny, who is under custodial interrogation, denied all allegations brought against him. Sultana had accused him of sending obscene pictured through social media and threatened to make public more photographs, according to investigators. Sunny told the investigators that he knew the woman. They were once friends. Faysal Rana, a brother of Arafat Sunny, alleged that Sunny was being blackmailed by the woman. The woman wanted to tarnish the image of a cricketer, he told reporters.